My least favourite part of quiltmaking is basting quilts. It really is the reason quilt tops languish in my closet. I think I'm slow at it, that's part of the problem. And now, with our TV in the basement, I can't rope Hubby into helping me anymore! I baste on the living room floor. When the TV was up here he had no choice - watch me get in his way or get on the ground and help me. Now he runs away to the TV as soon as he sees me pull out the masking tape and pins. Loving me is not enough, the only reason he was willing to help me is that he was allowed to use the tool involved. Men and tools, right? Man oh man, he can wield a Kwik Klip like the boss. 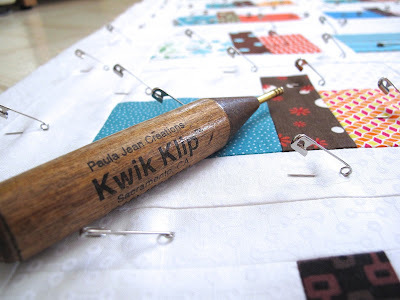 Honestly, if it wasn't for a Kwik Klip none of my quilts would get basted. I am a pin baster, and I use a lot of pins. (I didn't think it was a lot, but then I saw people commenting on an IG photo of someone else's basted quilt. So many pins! Wow, you sure use a lot of pins! And there I was thinking that it looked totally normal. But I don't get puckers with my quilting. Happy for that trade off.) So the Kwik Klip makes very short work of closing all those pins. And it saves both what is there of my nails and my fingertips. You simply hold the tool in your dominant hand, lift up the straight part of the pin, and clip it into place. Done. I've heard of people using an old teaspoon to the same effect. That, however, is not as fancy as the tool. And seriously, if a tool is what it takes to get your man to help you with the basting then a tool is what you should get. 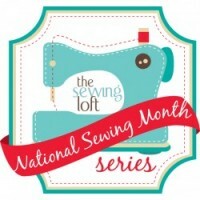 I'm sharing this post as part of National Sewing Month, brought to you by The Sewing Loft. Check out a month long list of sewers sharing their favourite tools. Anyhoo... thanks for posting, I'll be checking the other comments on this one! Cheers! I don't have one of those but I sure know why it would be nice to use one. The pins don't bother my hands, maybe I have nice pliable ones. I do use far less pins than you and still have no puckers. They add so much weight to the quilt for quilting that I prefer to have less if it still works well. I will look for the tool all the same as it looks fun to use. Basting was my least favourite until I discovered how to do it on a table top. I do it on a table 120cm x 70cm so it doesn't need to be large. I have found tutorials on how to do it but some are very complicated in my opinion. I will try and do a tutorial at some point and add it to my blog. Perhaps you have tried this method before and don't like. Can I tell you two years ago I bought a package of chop sticks from the dollar store there were 12 in it and the pattern at the top of them was the same as this tool! I stole them form my daughter (that's who I bought them for she has this fascination with chop sticks) and I use those! LOL and when I talk Honeyman into helping me I have plenty! (One night we had 4 of us closing pins because I do it in the middle of my kitchen floor and I guess the fam wanted to eat! Giggle! Too funny....my husband also helps me baste and he is too manly to need the tool, he toughs it out all on his own. I have also found that small screwdrivers work well if you do need more.